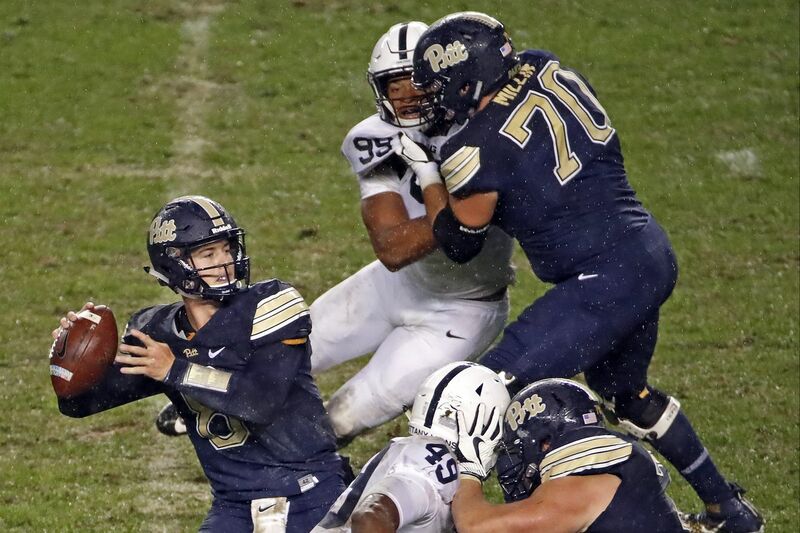 PITTSBURGH – With the rain falling relentlessly at Heinz Field, Penn State appeared to be stuck in the mud for the better part of the first half Saturday night against fired-up Pittsburgh. But one of several mistakes by the Panthers' special teams gave the 13th-ranked Nittany Lions some momentum going into halftime and Penn State solved Pitt's rushing attack in the second half, rolling to a 51-6 victory in the 99th renewal of the intrastate rivalry. The Lions (2-0) dominated on defense in the second half after the Panthers rushed for 214 yards in the first half. Pitt (1-1) rushed for minus-15 yards in the third quarter and minus-2 total yards while the visitors boosted a 14-6 halftime lead to 30-6. Quarterback Trace McSorley threw for two touchdowns and ran for one. One of his scoring passes went to redshirt freshman K.J. Hamler, who also raced 32 yards for Penn State's first touchdown of the evening. Mac Hippenhammer caught McSorley's second TD pass and DeAndre Thompkins returned a punt 39 yards for another score. The Nittany Lions also scored on a safety in the third quarter when Pitt was called for holding in the end zone. The Panthers lost more than 100 yards on penalties, and Penn State cashed in on poor play by Pitt's special teams. Punter and holder Kirk Christodoulou had an awful night, bobbling snaps as a holder on an extra point attempt and a field goal try. He also fumbled a punt snap, a ball that linebacker Jarvis Miller recovered at the Panthers 35, leading to a Penn State touchdown at the end of the first half, McSorley's 14-yard strike to Hamler with 26 seconds remaining. After the Panthers went three and out on their initial third quarter drive, Christodoulou hit a poor punt to the Pitt 40 and Penn State scored in eight plays, capped by McSorley's 4-yard run that made it 21-6. A penalty on the ensuing kickoff backed the Panthers up to their own 8. After a false start penalty and a 3-yard loss by Darrin Hall, quarterback Kenny Pickett was pressured and threw incomplete, but his team was penalized for holding, resulting in the safety. Thompkins got his hands on another bad punt late in the third quarter at the Pitt 39, followed the Lions' blocking wall along the left side and scored, extending the Penn State lead to 30-6. The Lions weren't finished, picking up big chunks of yardage on their first three plays – runs of 20 and 19 yards by McSorley and 20 yards by Miles Sanders – and produced their fifth touchdown on McSorley's pass to Hippenhammer, a redshirt freshman. Mark Allen scored on a 4-yard run with 6:17 remaining to add to Penn State's victory margin. After Penn State's Ayron Monroe recovered a fumble at the Pitt 34, backup quarterback Sean Clifford took the first snap of his career and lofted a 34-yard touchdown pass to Brandon Polk with 4:21 remaining, extending the lead to 51-6. For the second straight week, Penn State scored on its first possession of the game, aided by a 22-yard pass from McSorley to tight end Jonathan Holland and a 10-yard holding penalty against the Panthers. From the 32, Hamler took a handoff on a jet sweep to the left, turned the corner and sped into the end zone untouched. Pitt answered with a jet sweep of its own, a 38-yard gain by wide receiver Shocky Jacques-Louis, to spark its first touchdown drive. The Panthers converted three third downs, the last being on third and 10 when Qadree Ollison took a handoff and went over the left side from 13 yards out for the score. However, Christodoulou bobbled the snap on the extra point try, picked it up and tried to run but was tackled, and Penn State still led 7-6. Ollison went on to rush for 125 yards on 17 carries in the first half but Penn State held him in check in the final 30 minutes.